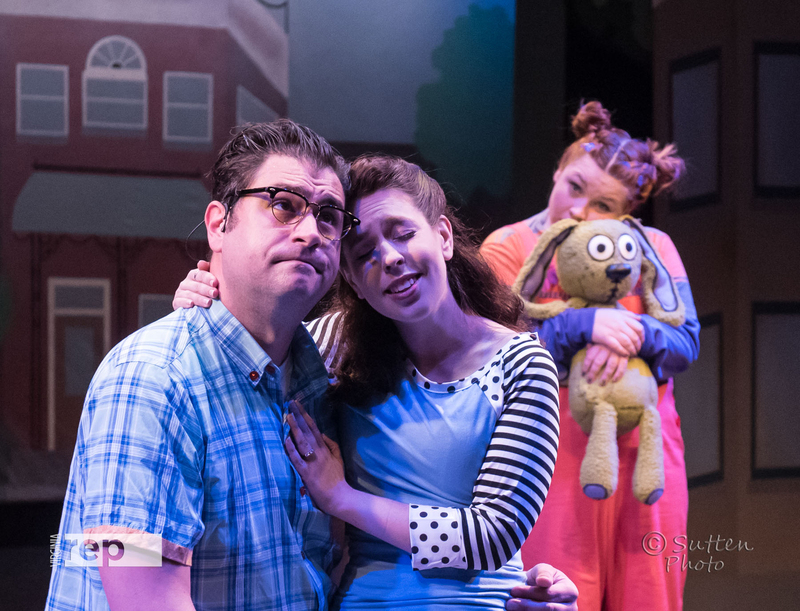 David Janosik, Louise Ricks, and Christina Ramsey star in “Knuffle Bunny: A Cautionary Musical.” Photo by Aaron Sutten. Virginia Rep’s Knuffle Bunny: A Cautionary Musical is as delightfully entertaining as you would hope a Mo Willems musical would be. With its energetic actors and fun scenery –including giant heart boxer shorts and pink bra – audiences of all ages can’t help but smile. Willems’ book, Knuffle Bunny: A Cautionary Tale, is the story of Trixie, a little girl who loses her special stuffed bunny while at the laundromat with her dad. Knuffle Bunny: A Cautionary Musical follows the same essential storyline while emphasizing a dad’s journey from a novice full of bravado to a humbled and exhausted parent. Determined to give his frazzled wife a break from their energetic daughter, Trixie’s dad, played by David Janosik, takes her to the laundromat. A bit hapless and a touch goofy, the dad sets off on his journey, only to discover that what should be a simple task can be much more overwhelming with a small child. In fact, it can make you question your ability to accomplish anything at all. Janosik completely nails his character. Throughout the show, he exerts impressive energy to move the story along and keep the audience engaged, and he brings many moments of hilarity, from his unselfconscious rocking out to his well-executed falls while trying to keep Trixie moving when she goes “boneless.” If you have ever tried to pick up a toddler who really doesn’t want to be picked up, you will relate to his struggles! Janosik mentions in the program that he has a daughter the same age as Trixie; his real-life experience likely helps him deliver emotional depth throughout the story. Louise Ricks, who plays Trixie’s devoted and a bit frazzled mom, exudes warmth and love; her smile truly lights up the stage! And what primary caregiver can’t relate to her desperate need for a break and simultaneous suspicion that her “break” may lead to even more work? The underlying message of the musical is love, and Ricks sings masterfully and humorously about the love partners have for each other even when one of them parents less than perfectly. The supporting actors, Brandon James, Corrine MacLean, and Eve Marie Tuck, bring added dimension to the show by engaging the youngest audience members as they dance and sing and even convey the emotion of the scene while trotting out the props. Mo Willems wrote the script and lyrics for Knuffle Bunny: A Cautionary Musical, so the show has the same sweet humor of his beloved books – and even some special appearances by another favorite Willems’ character, the Pigeon. 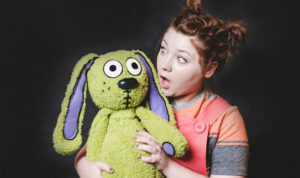 While Knuffle Bunny is a must-see for Willems’ fans, all families will enjoy the play’s funny one-liners, physical comedy, entertaining songs, and sweet message. After all, none of us parents do everything right, but in the end, maybe it’s enough for us to really, really love our kids. At forty-five minutes, with no intermission, the show is perfect for four and up. A great first show for preschoolers! Knuffle Bunny: A Cautionary Musical runs through August 12 at Virginia Rep’s Children’s Theatre at Willow Lawn. For showtime and tickets, go here. Writing has always played an important role in Catherine's life, from the horrible poetry she wrote as an adolescent to the slightly better thesis she wrote as a graduate student. She is passionate about connecting with people and celebrating the good things in life. When she isn't writing or hanging out with her family, she's probably dancing like no one else is watching (and thankfully, no one usually is! ).